VATICAN CITY (CNS) — A liturgy is not Christian if Christ is not the center of the celebration, Pope Benedict XVI said. “The conviction must grow in us every day that the liturgy is not 'our' or 'my' doing, but is God's acting in us and with us,” he said Oct. 3. The pope spoke to an estimated 20,000 people gathered in St. Peter's Square for his weekly general audience. The talk was the latest focusing on the liturgy in the pope's series on the subject of prayer. During the audience, Pope Benedict did not mention the Italian protester, Marcello Di Finizio, who had climbed onto the dome of St. Peter's Basilica Oct. 2 and remained there the next day to protest the economic policies of Italy and Europe. In his catechesis, the pope said, “If in the celebration (of Mass) the centrality of Christ does not emerge, we won't have Christian liturgy, totally dependent on the Lord,” who supports it with his presence. “This universality and fundamental openness, which is characteristic of the whole liturgy, is one of the reasons it cannot be created or modified by the individual community or by experts, but must be faithful to the forms of the universal church,” he said. The faithful fully experience the church in the liturgy, which is “the act in which we believe God enters into our reality and we can meet him and can touch him. 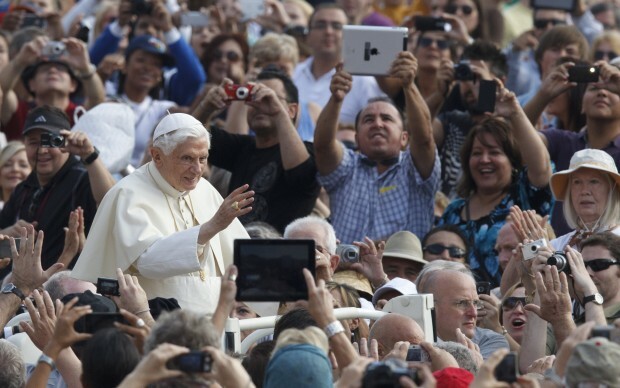 … He comes to us and we are enlightened by him,” the pope said. For that reason, when people focus attention only on trying to make the liturgy more “attractive, interesting or beautiful, we risk forgetting the essential: The liturgy is celebrated for God and not for ourselves. It is his work,” he said. God is the subject of the liturgy and all the faithful must open themselves up to him and let themselves be guided by him and his body, the church, he added. “Christians rediscover their true identity in Christ” and that is why prayer needs always to be looking toward Christ, speaking to him and listening to him. After his main talk, the pope greeted students of the Pontifical North American College who were to be ordained deacons Oct. 4 by Archbishop John J. Myers of Newark, N.J.